Time: 3 hrs. 15 mins. 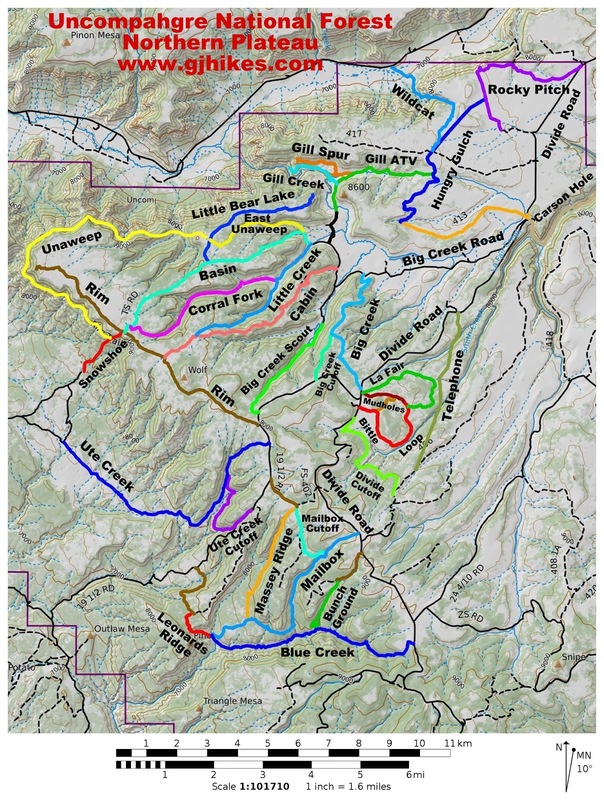 The Big Creek trail is located in the Uncompahgre National Forest near Grand Junction, Colorado. The trail stretches from its lower trailhead on the Big Creek Road, Forest Road 403, to its upper trailhead on the Divide Road. The road is open to all modes of travel but there are a couple of spots near the lower end that will require a high clearance 4-wheel drive vehicle. 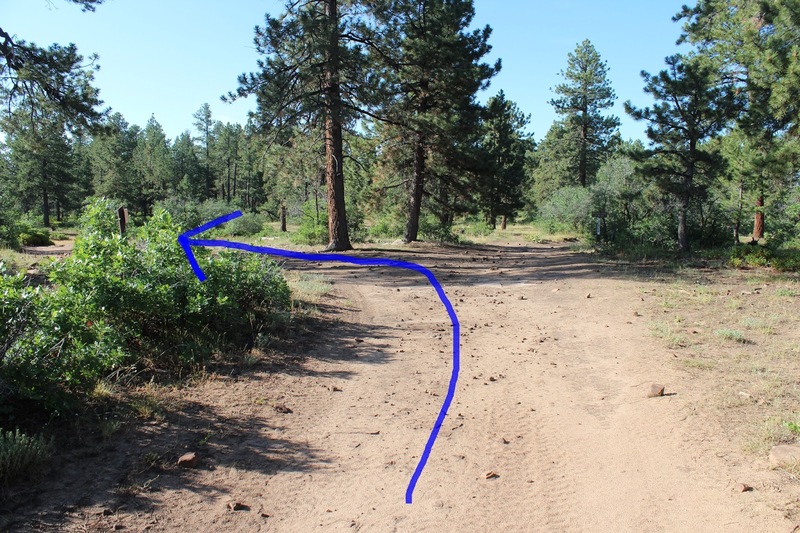 To get to the lower trailhead where this post begins measure about 3.5 miles from the northern forest boundary on Divide Road driving south and turn right on the Big Creek Road, Forest Road 403. Travel another 3.7 miles to the Big Creek trailhead on the left side of the road. If you would rather begin at the upper trailhead instead of turning at the Big Creek Road stay on Divide Road for about another 5 miles and you will find the upper trailhead sign on the right side of the road. The trail starts out at a gentle climb following the road toward the ridge. There is a good camping spot nestled in the trees on the right where the road makes its first bend. The trail gains most of its elevation within the first mile. It doesn't start off quite as steep as the Cabin Trail. After the first mile the trail follows the ridge above Big Creek Reservoir. The hiking from here to the turnaround point at the Divide Road is more of a pleasant stroll through the forest with deer, elk, grouse and turkeys providing picture taking opportunities along the way. 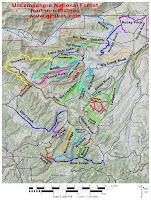 The trail makes a sharp left hand turn at the 2.25 mile point where the Big Creek Cutoff trail continues along the ridge toward the Rim Road and the Big Creek trail heads over to the Divide Road. The remainder of the trail between the cutoff and the Divide Road is mostly flat with spruce, aspen and ponderosa pine lining the way. The Divide Road is reached after almost 4 miles of total hiking. For anyone that would like a shorter hike without a whole lot of elevation change you could park in this area and hike the trail in the other direction until you feel like turning around. Most vehicles can probably negotiate much of the first part of the trail if you would like to drive in a ways and find a camping spot. About 50 yards or so off to the side of the trail at one spot is a contraption called a turkey guzzler. It makes it hard to imagine how turkeys managed to survive all those millennia without someone providing such a thing as that. There are a few nice bucks in the area as well as doe and fawn. And a couple small herds of elk consisting mostly of cows, calves and yearlings. The level upper portion of the Big Creek trail is suitable for families with children of all ages. The trail is a great place for viewing wildlife. All of the elk that we saw were near the lower end of the trail within the first 1.5 miles of the lower trailhead. The deer were scattered about from one end of the trail to the next. All of the game seemed to stay on the move for the most part which allowed us to see different deer and elk on both the hike out and back. Other than that the fresh smells of the trees and wildflowers make for a most pleasant hike. If you would like to see it for yourself then all you have to do is 'Take a hike'.